Most of us use Mozilla Firefox for web browsing and prefer it over the default Windows browser Internet Explorer. And the best part of Firefox is that it can be loaded with Add-ons or Plugins which actually add to the functionality of this amazing browser. But the problem comes when we uninstall and reinstall or when we install it after putting on a new windows. All the addons and extensions gone. So whats the remedy??? 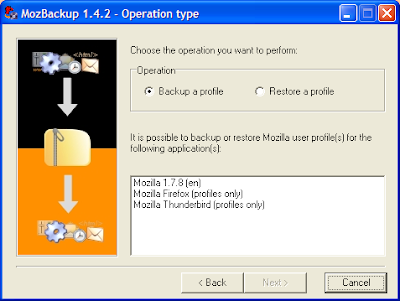 The solution is a very nice freeware application called MozBackup which helps us backup all our Mozilla Firefox settings as and when we need and in case of reinstall it helps to reinstate the firefox to its fully loaded state from that backup. 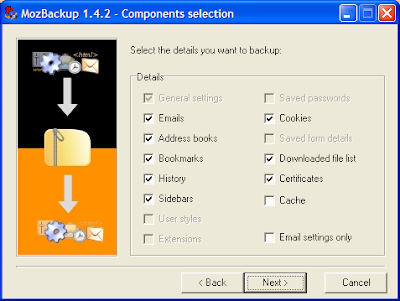 Not only it backs up Firefox but can also backup the following: Mozilla Thunderbird, SeaMonkey, Mozilla Suite and Netscape profiles. Installation is pretty simple and the App. has a plenty of options to be toyed with. The following screenshots tell them all. So you can either backup or restore a save profile. So there is no need to worry about losing those extensions just let the MozBackup do the needful. Want to sync your settings on the Go??? can u tell something similaar for IE ?? ?